Happy Halloween! 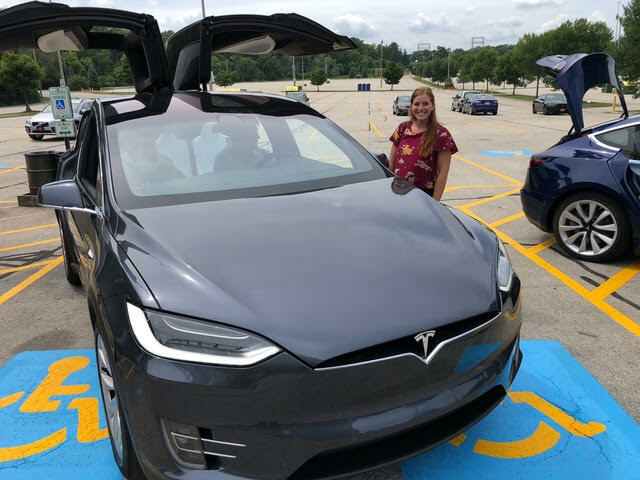 Let’s talk about something that isn’t spooky: driving electric! With momentum building, from hundreds of new models hitting the market soon and the Volkswagen Settlement providing an opportunity for public infrastructure, there’s no reason to get a fright over driving electric. I’ve heard interested people point to a few reasons why they might be a little spooked by the transition to driving electric. So let’s demystify some of these potential scares. Potential Scare #1: I can run out of juice! Not to throw her under the *hopefully electric* bus, but I got a text on Sunday from a friend who said she ran out of gas on the highway. Running out of juice, whether electricity or gasoline, might be an issue with any type of car. Just like you plan your gas station stops in a gasoline car, you plan your charging station stops in an electric car. The real difference is that your garage is your primary fueling place. And, unlike gasoline cars, you can leave the car on as you refuel, which means you can leave the heat on too! No more waiting out in the cold as you pump gas. For me, the real scare is pumping gas on a cold, dark night by myself. Plugging in my car after I pull into my garage, on the other hand, is not a spooky task! Potential Scare #2: Batteries are flammable! So is gasoline! And you have to pump gasoline into your car, physically exposing yourself to its smells and dangers. The battery packs in vehicles don’t require regular human interference and are isolated into small packages, meaning that even if one of them malfunctions, it’s not likely that an entire battery pack will catch on fire. Not to mention that many gasoline car fires start as a result of a mechanical failure, which is less likely to happen with the very few moving parts in an electric car. All cars are dangerous – that’s not new. But, did you know that electric cars can actually be safer than gasoline cars? Electric cars are less likely to roll over because they tend to have a lower center of gravity, mostly due to the heavy batteries being placed along the bottom of the car. The all-electric Chevy Bolt, which you’ll hear more about in next week’s post, was given the highest possible crash test rating and was named a 2017 Top Safety Pick. The safety of electric cars shouldn’t be a cause for concern. Potential Scare #3: I’m just not as comfortable with electric cars! I totally get that. Electric cars are somewhat new and do require a bit of behavior change from the driver. But, you can trust that electric cars are an extremely reliable, convenient, and fun swap for your gasoline vehicle. I don’t feel the need to understand exactly how my gasoline car works. I trust that when I turn the key, the car starts and I can go on my merry way. I know how to change a tire and add washer fluid to my car… anything else requires a trip to a mechanic. The good news is that an electric car doesn’t need much besides that! No oil changes, and again, fewer moving parts means less can go wrong. What I really need, and I’m willing to venture many of you feel the same way, is a car so reliable that I never have to think about how it works. We all want a reliable and convenient car. To which I enthusiastically say, you should definitely consider switching to drive electric! Driving electric doesn’t have to be scary. To prove it, next week I am going to drive Bergstrom Chevrolet’s Chevy Bolt over 800 miles from Madison to Detroit and back. 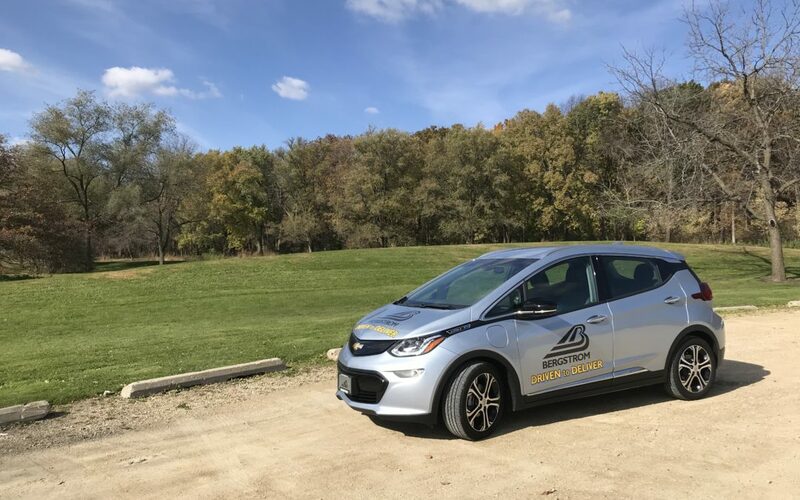 If you want to follow along in real time, I’ll be taking over RENEW’s Twitter account next week, where I’ll share my experience taking an electric road trip through the Midwest! Also, check out our new web page devoted to electric vehicles and driving on renewable energy. In my last blog I talked about how many new electric car models are coming to market in the next few years. This is great news but also shines a light on the public charging infrastructure needed to support all these news makes and models. Here’s where the “Volkswagen Settlement” comes in. In 2016, a federal court approved a settlement with Volkswagen (VW) requiring the car company to spend upwards of $15 billion to reduce environmental air pollutants from transportation in the U.S.
VW admitted to producing 11 million diesel vehicles between 2009 and 2016 that purposely cheated emissions tests designed to limit chemicals called “nitrous oxides,” or NOx. NOx causes respiratory diseases like asthma, emphysema, and bronchitis. As a result of VW’s cheating, their diesel vehicles emitted NOx at up to 40 times the federally accepted level. The “VW settlement” is designed to decrease NOx emissions from the transportation sector to counteract the damage done while these vehicles were in operation. 1. VW will provide up to $10 billion to owners and lessees of VW and Audi 2.0-liter diesel cars with the NOx cheating software. Nearly 500,000 cars were affected, the largest false advertising case in US history! The deadline for owners to submit a claim has passed. 2. VW also had to put $2.9 billion into an environmental mitigation trust fund to be shared by states and tribes. States are set to receive funds based on the number of cheating vehicles in operation in the state. States are to develop their own programs for spending the money. Up to 15% of the funding can be used to support light-duty zero emission vehicle infrastructure, like public charging stations for electric cars. 3. To further reduce air emissions, VW also has to spend $2.8 billion on clean air infrastructure. $800,000 of this funding will be spent in California. To administer this fund VW created Electrify America, which is installing charging stations across the country and running a nationwide campaign promoting electric vehicles. Check out their first commercial! More information on the settlement companies, violations, and enforcement can be found here. Wisconsin was allocated $67.1 million from the environmental mitigation fund. In May, the state approved a plan for almost two-thirds of our total VW funding. Based on the plan, $42 million will be spent by June 2019 to purchase new and cleaner transit and state fleet vehicles to replace older and more polluting vehicles. The transit part is structured as a transit assistance grant, in which local governments receive a grant to upgrade or replace their transit buses but see a reduction in their state transit funding in subsequent years. Now, I am all for clean transit but I am disappointed that Wisconsin didn’t allocate funding for electric vehicle infrastructure. Per the settlement, Wisconsin is allowed to spend $10 million on infrastructure, such as charging stations, to help drivers of light-duty cars and trucks. Of all 46 states that have submitted a plan, Wisconsin is one of 4 that didn’t choose to allocate funding to this zero-emission vehicle infrastructure. I am excited to see Electrify America charging stations popping up across the country. That campaign in nationwide, though. And we know that ensuring people can drive their electric vehicles and recharge them like they refuel their cars today is going to be critical to getting more uptake here in Wisconsin. Therefore, we want to see VW funding spent on electric vehicle infrastructure right here in Wisconsin. It is possible to change our state plan for VW settlement funding. More than one-third of the funding, over million, has yet to be allocated. And, if there is funding left over from the round, it can be re-allocated. RENEW believes that any future VW settlement plan should include funding fast recharging stations so people can drive electric cars all over Wisconsin and know they can get anywhere they need to go. $10 million can go a long way to support a state-wide network of charging stations! 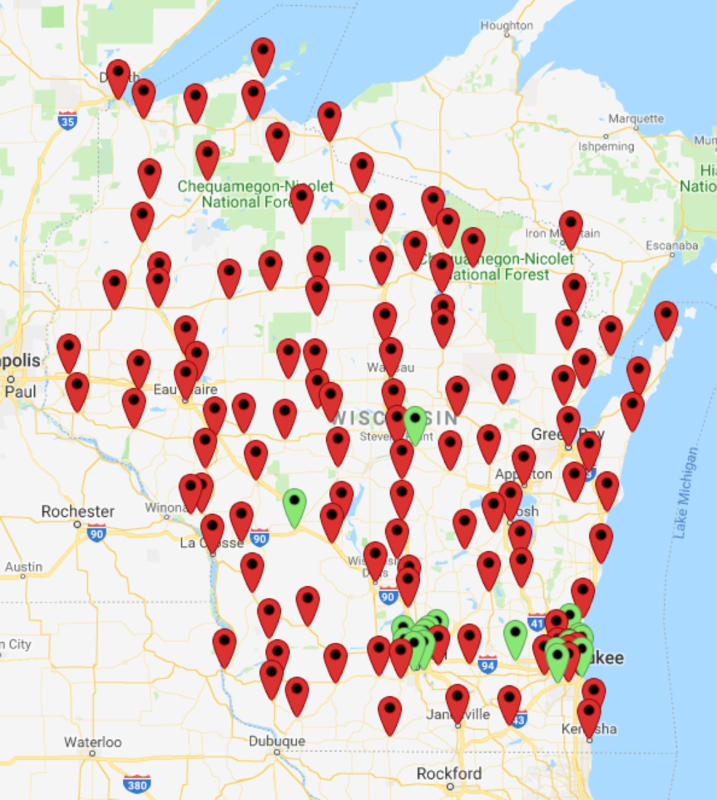 Such a network would allow Wisconsin’s electric car drivers to go anywhere in the state with confidence – in fact, we estimate that the funding could cover most of the cost to install three recharging stations each in 111 locations all over the state. That’s enough to have one every 25 miles, giving drivers options when they are on the road. It’s my hope that we can use “Dieselgate” to do the most good in Wisconsin. If the goal is to reduce air pollution, I don’t know if it gets any better than renewable energy powered electric transportation! Next week we’ll talk more about charging: how, where, and why driving electric is convenient, safe, and fun. It’s an exciting time to be studying electric vehicles. From companies pledging to transition their fleets to auto manufacturers promising new models, momentum around the transition to electric cars is building. The Twin Cities’ transit authority cancelled a large diesel bus purchase due to public pressure to electrify. Duke, a Florida utility, announced that they are installing 530 public charging stations in Florida. Electrify America, Volkswagen’s subsidiary responsible for administering part of the emissions settlement, announced plans to spend money on overnight charging infrastructure in residential areas, in addition to expanding their metro and regional infrastructure investments. The Alliance to Save Energy’s 50×50 Commission on U.S. Transportation Sector Efficiency issued recommendations calling on all levels of government to support a successful transformation of energy efficiency in transportation. Mercedes-Benz began construction on a vehicle battery manufacturing facility in Alabama, right next to their SUV factory. The United States reached 1 million electric vehicles sales! For the graphic we chose to include models from recognizable brands that are widely available in the United States. I did take a look at all car manufacturers across the globe and counted 222 electric car models that will be available in 2025. That’s a lot of cars to test drive! With over 200 new electric cars by 2025, from compact cars to pick-ups and SUVs. Soon there will be an electric car for everyone. Now that we know there are plenty of new models available soon, next time I’m going to dive into the Volkswagen emissions settlement and outline key actions we can take to support the infrastructure EV’s require. For many years, Focus on Energy’s renewable energy incentive program has labored under an operating environment resembling a regulatory roller-coaster. It has weathered funding suspensions, mid-stream budget reallocations, and an effort to replace rebates with loans. But that extended wild ride is finally coming to an end, the result of Public Service Commission orders that will restore stability and consistency to Focus’s renewable energy offerings. The PSC’s ruling in June 2018 locked in $22 million in renewable energy incentives for the 2019-2022 funding cycle, split equitably between residential and business customers. That allocation amounts to a funding increase of $4.7 million, or 27%, over the previous four-year cycle. In addition, the order granted flexibility to move funds between residential and business customers to better ensure all the funding is utilized. 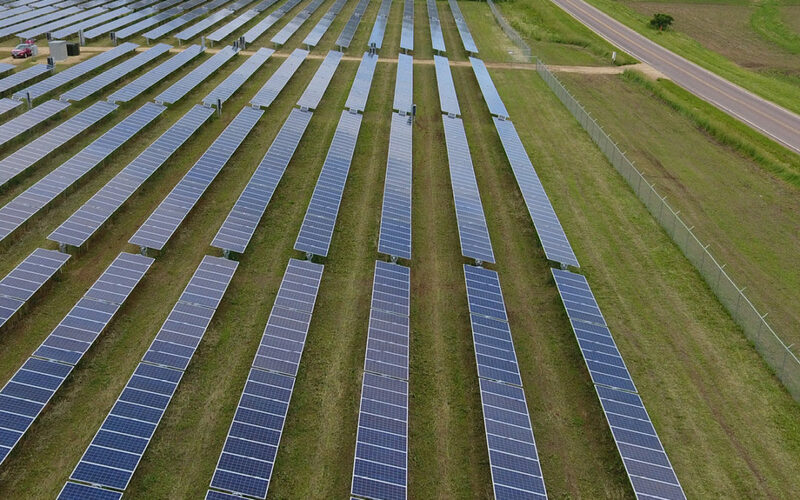 A subsequent order in September 2018 locked in improvements to the business program, including a streamlined application process, a guarantee of request-for-proposals issued three times per year, and a funding set-aside for mid-size projects (between 20 and 100 kilowatts for solar power projects). We are starting to see the results of these positive decisions! The business program has an RFP on the street with applications due next week, on Tuesday, October 23rd, for the first round of projects that will be installed in 2019. All in all, the PSC’s decisions tracked closely with the recommendations submitted by RENEW and its member businesses regarding funding levels and program design. But before we dive into how it happened, RENEW wishes to thank PSC Chairperson Lon Roberts and Commissioners Mike Huebsch and Rich Zipperer for their votes in support of a strong, predictable, and consistent renewable energy program for Focus on Energy! We would also like to thank the Commissioners’ Executive Assistants and the Commission’s Focus on Energy staff team for the role they each played in setting up success for 2019 through 2022. Our goals for the 2018 planning process were twofold: first, to lock in a stable and well-funded operating environment for renewables; and second, to integrate needed process improvements to the incentive program targeting commercial installations. Our member businesses assisted us in formulating these recommendations which were based on an assessment of recently adopted tax and trade policies and their likely effects on customer appetite for onsite renewable generation. Our success was made possible by the participation of several influential constituencies that weighed into the formal planning docket. For the first time in Focus on Energy’s history, associations representing general contractors, builders, and architects voiced their support for a well-funded renewable energy program. Drawing upon his background representing contractors at the Capitol, Jim Boullion, RENEW’s Government Affairs Director, was instrumental in engaging these groups to submit a letter conveying their support for continuing current funding levels over the next four years. In addition, renewable energy businesses and associations across solar, biogas, and geothermal technologies weighed in with support. These businesses span the entire state, which helped us make the point that the renewable energy program serves rural and urban areas. 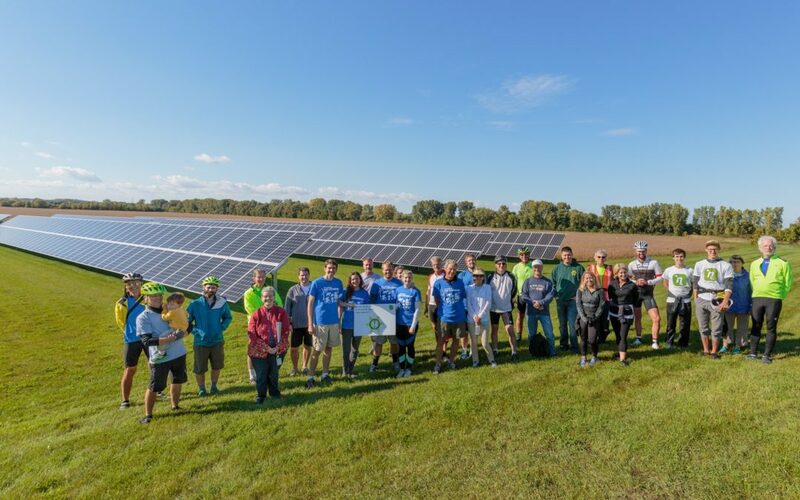 Our success in 2018 was also made possible by RENEW’s organized media outreach and recognition swings across Wisconsin from 2015 through 2017. Those events highlighted the increasing appeal of rooftop solar for commercial customers, school districts, and agricultural producers, and called attention to the Focus on Energy incentives that moved these installations to completion. The ribbon-cuttings and award ceremonies in locations such as Racine, New Berlin, and Darlington proved effective in generating positive coverage from the press. 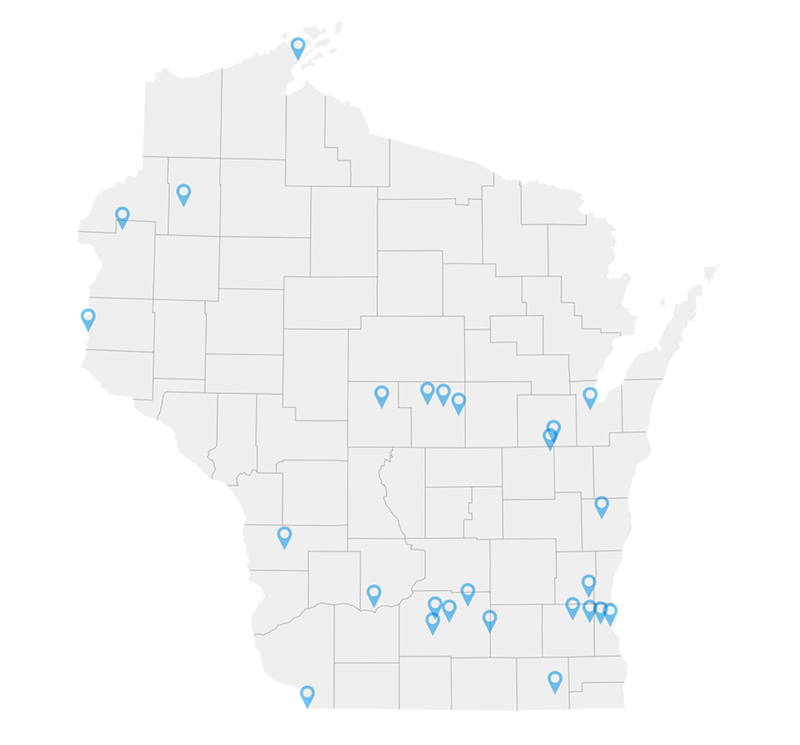 RENEW complemented that effort with analysis documenting the renewable program’s statewide reach and effectiveness in supporting Wisconsin businesses, both at the customer and contractor level. That effort first bore fruit in October 2016, when the PSC decided to scrap the sputtering loan program and replenish the incentive budget for 2017 and 2018 with unspent loan dollars totaling more than $8.5 million. With that commitment in place, renewable energy businesses could bank on a relatively stable and adequate funding base, and break free of the fits and starts that had hampered their ability to meet growing customer demand. Getting the 2017 and 2018 programs in place and, through our members, showing them to be successful gave us a strong negotiating position to showcase “what is working” and to advocate for continued rebate funding for 2019-2022. In the end, it was a combination of RENEW’s strong advocacy on behalf of our member businesses and allies, and the PSC’s desire to see the program succeed that led to this positive outcome. We are fortunate to have so many actively engaged members who understand the value of speaking up with a unified voice. Once again, thank you to our Members and Stakeholders who supported our positions, and to the PSC Commissioners, Executive Assistants, and Staff who all played instrumental roles in this process. We look forward to a strong Focus on Energy renewable energy program for 2019 through 2022!